There is increasing interest in the potential of UAV (Unmanned Aerial Vehicle) and MAV (Micro Air Vehicle) technology and their wide ranging applications including defence missions, reconnaissance and surveillance, border patrol, disaster zone assessment and atmospheric research. High investment levels from the military sector globally is driving research and development and increasing the viability of autonomous platforms as replacements for the remotely piloted vehicles more commonly in use. UAV/UAS pose a number of new challenges, with the autonomy and in particular collision avoidance, detect and avoid, or sense and avoid, as the most challenging one, involving both regulatory and technical issues. 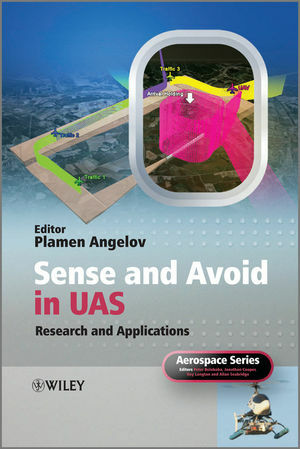 Sense and Avoid in UAS: Research and Applications covers the problem of detect, sense and avoid in UAS (Unmanned Aircraft Systems) in depth and combines the theoretical and application results by leading academics and researchers from industry and academia. Sense and Avoid in UAS: Research and Applications is an invaluable source of original and specialised information. It acts as a reference manual for practising engineers and advanced theoretical researchers and also forms a useful resource for younger engineers and postgraduate students. With its credible sources and thorough review process, Sense and Avoid in UAS: Research and Applications provides a reliable source of information in an area that is fast expanding but scarcely covered. Plamen Parvanov is a senior lecturer in the School of Computing and Communications at Lancaster University. He is an Associate Editor of three international journals and the founding co-Editor-in-Chief of the Springer journal Evolving Systems. He is also the Vice Chair of the Technical Committee on Standards, Computational Intelligence Society, IEEE and co-Chair of several IEEE conferences. His research in UAV/UAS is often publicised in external publications, e.g. the prestigious Computational Intelligence Magazine; Aviation Week, Flight Global, Airframer, Flight International, etc. His research focuses on computational intelligence and evolving systems, and his research in to autonomous systems has received worldwide recognition. As the Principle Investigator at Lancaster University for a team working on UAV Sense and Avoid fortwo projects of ASTRAEA his work was recognised by 'The Engineer Innovation and Technology 2008 Award in two categories: i) Aerospace and Defence and ii) The Special Award which is an outstanding achievement.